Ukrainian household care brand nO% green home, owned and produced by the pharmaceutical scientific research centre Alliance of Beauty, presents ECO Dishwashing Gel with Mustard. This is a 100% safe and natural dish soap that you can use to wash all kinds of dishes and kitchenware, including baby bottles, pacifiers and tableware. Contains 99.78% of natural ingredients. Free of chlorine, phosphates, parabens, fragrances and synthetic colourants. The product has a unique biodegradable formula based on green surfactants and other natural ingredients. It does not contain SLS/SLES or other aggressive surfactants, but it still lathers well and makes dishes squeaky clean and shiny. The gel is easy to rinse off and doesn’t leave streaks or any other residue. Suitable for washing hard-skinned fruit and vegetables. Dishwashing gel by nO% green home easily removes grease, burnt food and other dirt from various surfaces, including ceramics, porcelain, glass, crystal glass, metal, and wood. It remains effective in both cold and hot water. The product eliminates bad odour and doesn’t leave any smell except for a subtle scent of freshness. ECO dishwashing gel is formulated with mustard powder that has long been used as a household cleaner due to its ability to remove various kinds of stains without scratching the surface. To take care of your hands, the product is infused with organic (green) glycerine and chamomile extract. Glycerine helps to lock in moisture in the epidermis, while chamomile extract soothes the skin and eliminates harmful microbes. The product comes in a large, convenient bottle with a pump dispenser. It lasts long and helps to save your family budget. Dermatologically tested. Safe for human health and the environment. ISO 14024 certified. Safety and environmental sustainability confirmed by the Living Planet eco certificate (see the Green Crane label on the bottle). Directions. Apply several drops of product to a sponge, wash the dishes and rinse thoroughly with clean water. You can also dissolve 1 tsp (5ml) gel in 3L water, soak the dishes, fruit or vegetables for 1 minute, scrub if necessary, and thoroughly rinse with clean running water. Precautions. Avoid contact with eyes. In case of contact with eyes, rinse immediately with plenty of running water. Consult a doctor if necessary. Use only as intended. Keep away from children. Ingredients. Water, 5-15% Anionic Surfactants, <5% Non-ionic Surfactants, Salt, Mustard, Complexing, Glycerin Organic (Green), Preservative, Chamomilla Recutita Flower Extract, Xanthan Gum, Citric Acid. Want to buy ECO Dishwashing Gel with Mustard? Call us or submit your order via our web site! 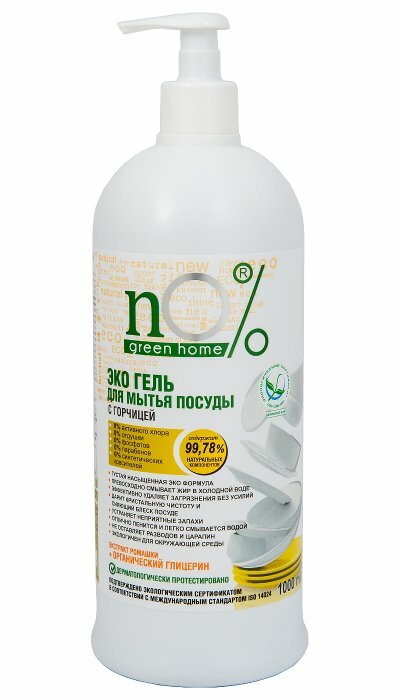 nO% green home is a line of natural, safe and effective dishwashing liquids and house cleaning products produced by the pharmaceutical scientific research centre Alliance of Beauty (Ukraine). The products have a completely biodegradable formula, they do not harm human health and do not pollute water and soil. At the same time, they effectively remove grease and all kinds of dirt, including persistent stains and burnt grease. nO% green home products are based on mild surfactants (surface active agents) and natural ingredients that have been used for cleaning for centuries, such as apple cider vinegar, mustard powder, baking soda (sodium bicarbonate), lemon juice and Castile soap. Their safety is confirmed by a certificate issued by the certification body Living Planet (Ukraine) in accordance with the international standard ISO 14204 (see the Green Crane logo on the packaging). nO% green home presents several kinds of eco dishwashing gel, eco liquid household soap suitable for all surfaces and laundry, and eco all-purpose cleaning cream with delicate abrasive particles. All products are dermatologist-tested and enriched with glycerine and other moisturising and soothing ingredients designed to take care of the hands. Free of active chlorine, phosphates, parabens, and alcohol.